Good news Colnectors! 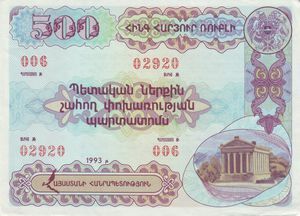 Our banknote catalog now displays more than 20,202 banknotes. Over 2,000 new banknotes were added to the banknote catalog since we last announced 18,181 banknotes last September. Again, we would like to cite and recognize the work rendered by our banknote catalog coordinator, Vidami Istvan [mozistv]. 20,002 BANKNOTES TO CHOOSE FROM! Looking for the banknotes you're wanting to have? Check the newest banknotes in the banknote catalog. Another set of new banknotes have been added since September; hence, this means that a lot of collectibles were added to the selection. See for yourself what you missed. Let your friends know about this wonderful news. With our easy sign-up process, you can invite your friends to join Colnect. Share your experience on Colnect and impart to them the benefits of joining our community. If you are a banknote collector and haven't joined Colnect, then give it a try. Swapping is fun and watching your banknote collection grow is priceless. Colnect is jubilantly declaring a sum of 18,181 banknotes in banknote catalog. Banknote collectors can now enjoy this galore of 18,181 banknotes. Our collectors will be spared from the arduous task of accumulating banknotes in collection. Everything is in our banknote catalog now. There is no need to go through the exhausting process of trading your banknotes manually because we've got it all for you. Colnect would like to commend this extensive quantity of banknotes to our banknote coordinator Vidami Istvan. Banknotes from different countries are available for trading. Pick among our miscellany of banknotes and get the right one for you. There are numerous banknotes in our catalogs just for you. Tell everyone about this. Are you a banknote collector? Join our community in Colnect and see our banknote catalog. You will certainly like our banknote collection. Our big collections will take your collecting hobby to new heights. Swap with collectors globally. Collect and collect now with Colnect.